While preparing to move to France in 2013, we were catching up on all our DVR’d episodes of Rick Steve’s Europe by watching an episode each night before bed. 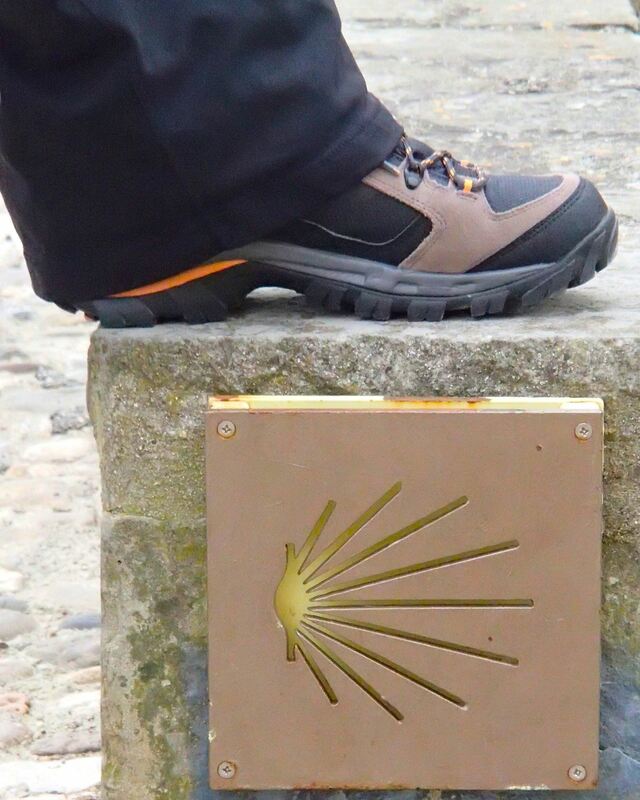 During an episode about Spain, we saw a short blip about the Camino de Santiago showing hiker’s with scallop shells tied to their backpacks. This was immediately pushed to the back of our minds as preparations continued and our leave date approached. Once we arrived in France and started to settle in Tracy was sitting at the window seat having her morning coffee, one morning near the end of April, and spotted a hiker walking up the street. As he passed she noticed a scallop shell on his backpack and remembered hearing somewhere that it was significant somehow. While having breakfast with Alan a short while later, the hiker came up in conversation along with a request for Alan to do a bit of research to fill in memory gaps pertaining to the scallop shell. During the few weeks we had been in France, we would take Kiara to the park at the end of the block to run and play. On these outings we noticed a “light” like emblem on a small sign in a couple of places along the path. Though we had wondered aloud what the signs meant, we didn’t think much of it until Alan started doing some online research about the hiker’s with scallop shells. Upon finishing a short Google search, Alan came up with hundreds of links and photos about the Camino de Santiago de Compostela, or “The Camino” — we were both fascinated and intrigued and spent a few hours looking at photos and Web sites. Alan decided to look into it a little further and found that there all hundreds of routes leading to Santiago, one of which goes right past our front door. The following week the city workers of Carcassonne had updated a signboard in the park where Kiara liked to play. We noticed the new sign and walked over to take a look. 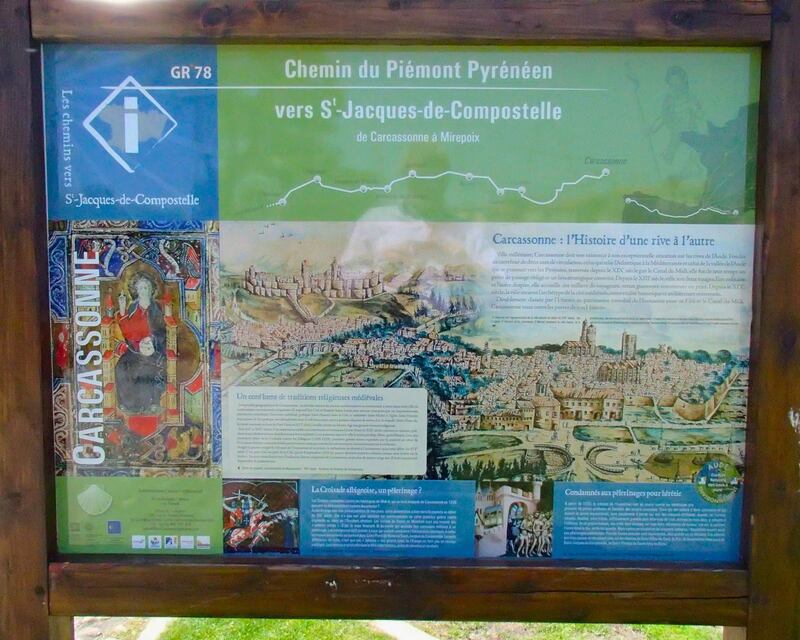 It was a reader board regarding The Camino showing that the church at the end of the block and the tiny chapel nearby where a pilgrim hospital at one time serving those hiking The Camino through Carcassonne. Intrigue quickly became obsession and we decided that we wanted to give it a try and started looking at when we should do it. At the beginning Alan mentioned the summer of 2014 for the hike, but Tracy said, “Why not this summer, we’re retired, we can take all time we need.” So we decided to run on impulse and immediately started training, researching and purchasing equipment. 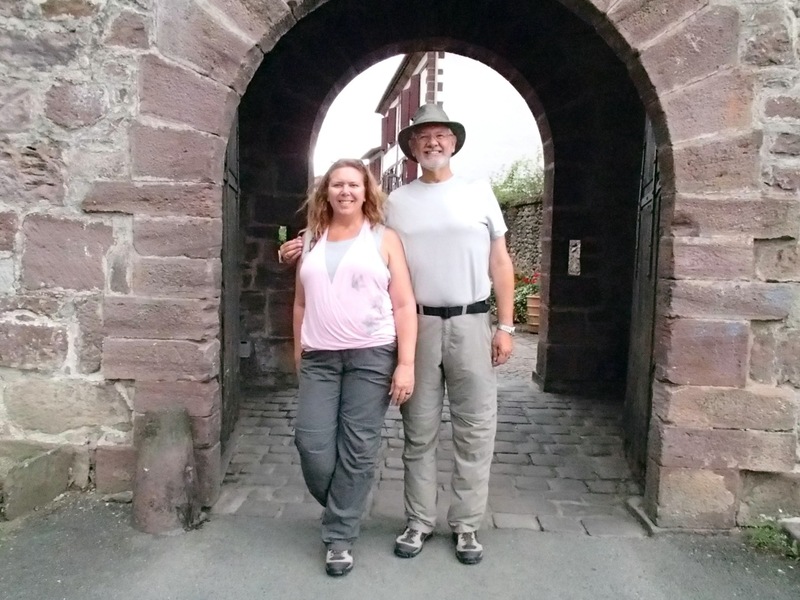 By August 25 we found ourselves on a train to St. Jean Pied-du-Port, the starting point for the Camino Frances, or French Way, the 800 kilometers/500 mile route to Santiago de Compostela. Route: via train from Carcassonne to Toulouse to Bayonne to St. Jean, passing through Lourdes, saw the Cathedral from the train — it’s stunning, and many other small cities that interested us as possible future residences in France. The small commuter train was a beautiful trip up to Saint Jean from Bayonne. We met Jennifer (North Carolina) with the other pilgrims taking the train into St. Jean, she had spent four months in Europe leading up to the Camino. A very nice lady, we spent some time together during our first week before and after dinner, and with whom we are still in contact. We met Doug and Stephanie (Canada) leaving the train station and walking into town, they reminded us of our daughter’s in-laws and we referred to them as Steve and Marilyn for the first couple of days until we reintroduced ourselves so we could get their names again. We are not normally so forgetful, but you meet a lot of people on the Camino and we hadn’t developed a system to remember all their names until week two. St. Jean was like walking through a fairy tale. The old, narrow, cobblestoned streets with a continuous row of businesses and residences squeezed side by side in varying architectural styles, height and building materials helped to encourage the fairy tale feel of the historic district of this small city. We stopped at the Pilgrim’s Office and waited in a relatively short line to pick up our Camino credential and receive our first stamps before heading out to see some of the city and play “tourist” for a moment. We had reservations at the Ramuntcho Hotel, and found that they had our room ready and had already reserved us a table for dinner that night and breakfast the next morning. 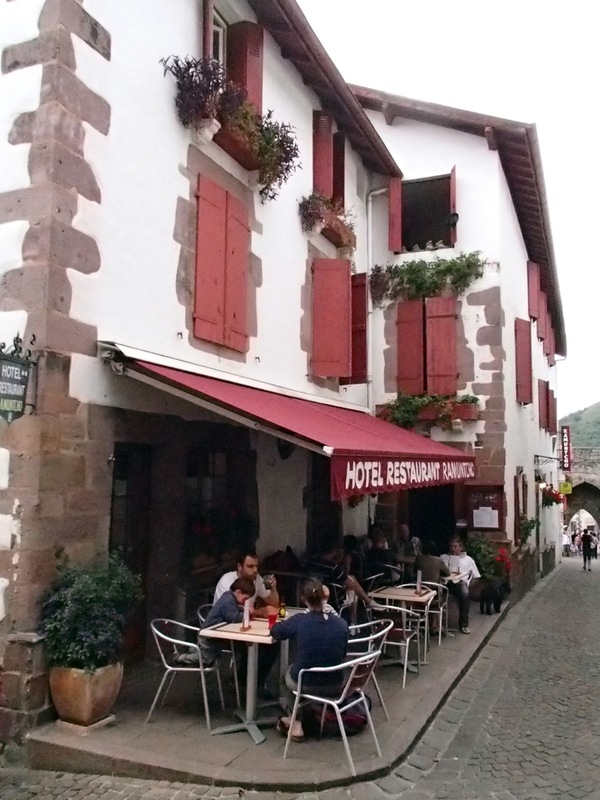 We found a small restaurant with an outdoor patio and sat down while we unwound from the day’s travel and after a refreshing pitcher of sangria headed back to the shops along the main street. We checked several small Camino shops until we found the perfect scallop shells to attach to our packs, then wandered through the narrow streets until we were stopped by a local exhibition of strength, a huge game of tug-o-war with an enormous rope. Sites visited: Porte St. Jacques 15th century (UNESCO status) also called the French Gate as those arriving on foot to St. Jean will pass through this gate; Notre Dame du Bout du Pont 14th century church, we stopped in and lit a candle for Kiara here as we had only lost her two weeks earlier; Porte D’Espagne or, Spanish Gate, this was our one planned destination as we hadn’t wanted to miss the opportunity for the “official start” of the Camino Frances photo.